The first time I introduced Sammie to a hard-core South Indian dish was back in late 2003. It’s a simple fiery shrimp masala (Yera Varaval in Tamil) that’s a favorite with my family and extended family. My mom, aunt Leela and my sister rock this dish with their own particular ways of making it. I introduced it to Sammie who by then was bragging about his increased tolerance for spicy food and his widening appreciation and knowledge of Indian food. He pooh poohed my advice to eat the shrimp masala in moderation and to eat it along with rice, vegetables and Sambar (lentil based curry) to balance the heat. He spooned the shrimp into his eager mouth, straight! He thought it was awesome and kept reminding me he was awesome as he wolfed it down. Let’s just say that he wasn’t feeling as awesome during the aftermath. I soothed the poor darling and agreed it was definitely my over spiced dish and not that he ate it like it was ice cream while claiming to know how to eat Indian food. Don’t worry his awesomeness is never going to actually read this. He looks at the picture and tells me he’s so happy he’s the one eating the food in the pictures. Well, since the “Shrimp masala” incident when he heard the words shrimp and Indian he was on the phone ordering take out, he refused to touch my coconut shrimp curry which was really on the sweet side. We finally had a break through a few months ago when I made Shrimp Biriyani. He hemmed and hawed about ordering pizza as a back up. But considering his fondness for lamb and chicken Biriyani and the aroma, he decided to give it a go. When I went back for seconds it was gone, every last grain of rice, every curled and browned shrimp had been carefully scooped onto his eager plate. I’m delighted he is finally cured him of ‘Indian shrimp’ phobia. He still won’t hear of trying Shrimp Masala which is one of my top ten favorites. Maybe some day we’ll get there. Meanwhile here’s the Shrimp Biriyani recipe. If you’re looking for Basmati rice at your local American grocery store, a lot of Basmati posers are jostling for space on the rice aisle, so shop with discretion. The only brand that comes close to the real deal is Vigo. Trader Joe’s has a very decent grade of Basmati rice too. If you can find the Tilda brand that’s even better. This less popular cigar smoking uncle of the popular green cardamom brings its own special flavor which is often under appreciated. Mix yogurt and half of all the wet and dry spices, 1/4 teaspoon turmeric, 1 bay leaf, 1 piece of cinnamon, half the salt, half of the chopped mint and cilantro. Add shrimp, mix well and marinate for about 30 minutes. Wash the Basmati rice until the water is no longer cloudy. 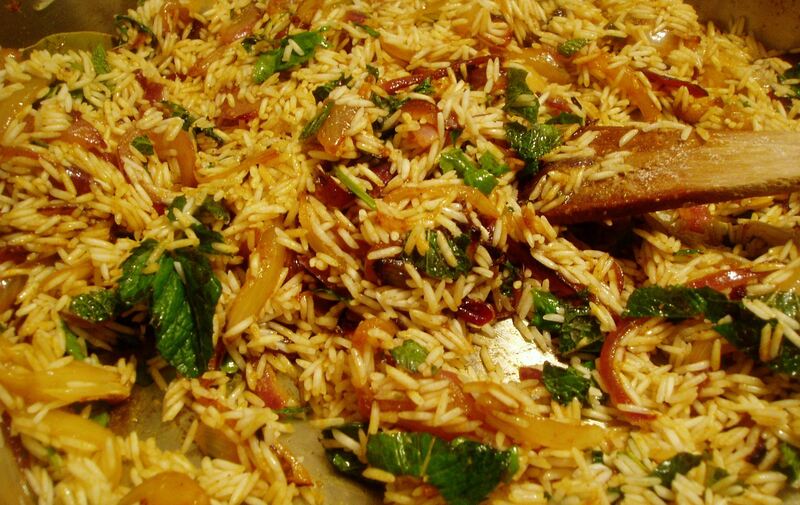 Add two or three crushed mint leaves to the Basmati rice along with more water and let it soak for about 20 minutes. Add half the butter and oil to a dutch oven or a pot with a good thick base. remove the shrimp from marinade and brown on each side. Set the cooked shrimp aside and reserve the marinade. Add remaining one tablespoon of oil to the pot. Add cardamom and remaining whole spices and let it splutter.Add sliced red and yellow onions and saute on medium heat until the onions start to brown. Take out a tablespoon (or less) of the browned onions and reserve for garnish. Add remaining wet and dry spices and saute, turn the heat down a tad and keep stirring, the spices combined with the garlic and ginger tend catch and burn if not carefully tended to constantly. Drain and add the rice, gently stir (so the grains don’t break) till the rice grains are coated with the spices and onions. Add two parts of liquid to one part of rice, the two parts of liquid will be a mix of water and the reserved marinade. Add the juice of one medium lemon. Bring to a boil and turn the heat down to low. Cover with an air tight lid and let it cook for about 15 – 20 minutes. A wide flat container will result in faster cook time than a tall and narrower container. Electric stoves also tend to speed up cook time and result in a little of the rice catching at the bottom. While the rice is cooking boil the eggs (soft or hard depending on your taste) and cut in half. You know it is done when the rice starts to fluff up just a bit but the grains are intact. One of the hallmarks of a good Biriyani is that the grains although cooked are not sticky. In a small skillet add 1/2 a teaspoon of butter, saute the cashew nuts and raisins. Set aside. 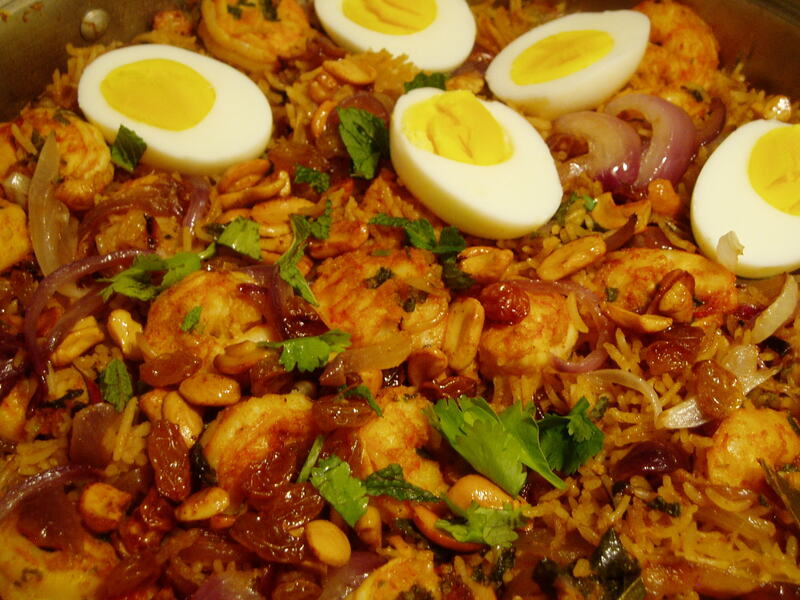 Top the Biriyani with the reserved onions, raisins, cashew nuts and eggs. Serve it with lemon or lime wedges on the side. A cooling salad with cucumber and tomatoes or a raita would be the perfect foil.